What is a 4-H Cloverbud? Pictured, from left, are Barnyard Bunch 4-H Club Advisor Advisor Ms. Mikala, Braxton, Brynn, Madison, Britney, Ann, Ava and advisor Ms. Kristen. What is a Cloverbud? In the 4-H world, it is like a pre-4-H member. A person in grades K-2 can be a Cloverbud. Cloverbud’s attend a regular 4-H club meeting. They have their own book and activities at that meeting. And their years as a Cloverbud count in their 4-H years. The Barnyard Bunch 4-H Club offers the Cloverbud program as do several other clubs in Highland County. This year the club’s Cloverbuds participated in a scavenger hunt, a listening and coloring activity, the T-shirt contest, made butter from cream, and led the 4-H and American pledges. Their biggest accomplishment was being chosen by the radio station, B105, for their submission of the American pledge during 4-H week in March. This got the Barnyard Bunch Cloverbud’s a pizza celebration from Snappy Tomato Pizza. Thank you to the club’s Barnyard Bunch parents for sharing the younger siblings with our 4-H club. Submitted by Sherri Helterbrand, Barnyard Bunch. 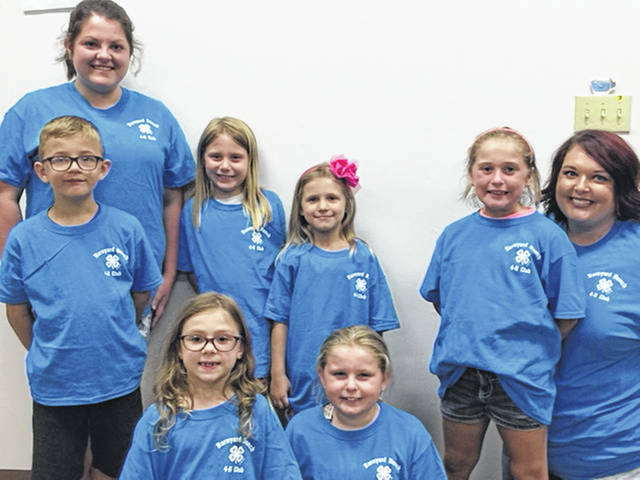 https://www.timesgazette.com/wp-content/uploads/sites/33/2018/08/web1_Cloverbuds.jpgPictured, from left, are Barnyard Bunch 4-H Club Advisor Advisor Ms. Mikala, Braxton, Brynn, Madison, Britney, Ann, Ava and advisor Ms. Kristen.